You are here: Home / Articles / A fun adventure with your dog! A fun adventure with your dog! Georgetown’s Bark Park is a personal favorite of mine. It’s beautiful, the people and dogs are friendly and it’s close! 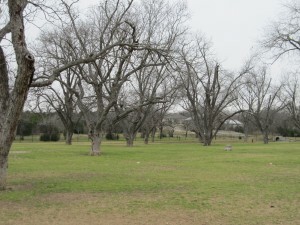 It has huge trees, providing shade as you sit and watch your dog. Shade is important for dogs that need to take a break and cool off a bit during the intense summer heat. There are also water fountains for the dogs, as well as their owners, and you’ll find that these are usually kept clean. Feel free to bring a ball or frisbee from home if your dog likes to fetch! Another great dog park that I recommend in the Round Rock area is Round Rock Dog Depot, which has large dog and smaller dog play areas. It offers an exciting recreational course, including an A-frame contact ramp, a tunnel, and a tire jump. There is a restroom area for pet owners that can be found in its outdoor pavilions, which are located on the outskirts of the dog park. There are also dog waste receptacles and hand sanitizer. 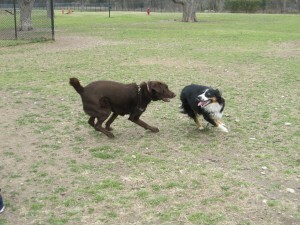 Shepard and Maddie playing at the dog park! Not all dogs enjoy being around so many other dogs. They may find the environment overwhelming and frightening. So it may be a good idea to do one or two short trips to see how your dog responds. I know most of us know this, but I would just like to remind everyone the importance of park etiquette. Please clean up after your pet and dispose of their “potty waste” properly. This is key to maintaining parks that are healthy for our pets. Please leave me a comment below and tell me any positive or negative experiences you’ve had at a dog park.